On May 10, visitors enjoyed tasting chunks of Okinawan brown sugar in the plaza in front of Palette Kumoji. 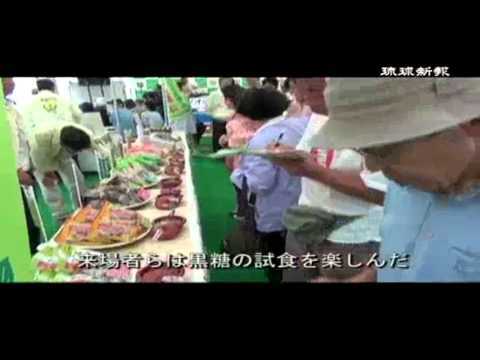 On May 10, or Brown Sugar Day, the Okinawa Non-Centrifugal Sugar Countermeasure Conference held an event promoting the consumption and sale of chunks of Okinawan brown sugar in the plaza in front of Palette Kumoji. Organizations related to the event will run a campaign to boost consumption of chunks of brown sugar both in and out of Okinawa through until September 6. 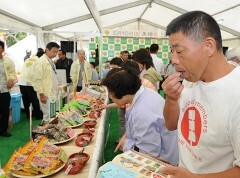 A tasting party for chunks of brown sugar produced in eight regions in Okinawa, as well as ice cream and drinks made from brown sugar was held. Takashi Tanahara, a chef who specializes in French cuisine, entertained visitors with a cooking demonstration of sweets made from chunks of brown sugar. According to the Sugar Industry and Agricultural Products Division of the Okinawa Prefectural Government, production volume during 2011 to 2012 of sugarcane, a basic ingredient of lumps of brown sugar, is estimated to be about 5600 tons, a drastic decrease from the 8339 tons for the same period the previous year.